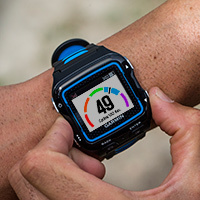 Want to be the first to receive the Forerunner 920XT, the new Garmin GPS Watch for Multisport? Fill in the booking form and as soon as the new Forerunner 920XT is available you will be notified by email and you can complete the online purchase and receive it without shipping. Comes from Garmin, the company that launched the first GPS watch sports for triathlon and multisport disciplines, an advanced GPS watch to train professional and amateur athletes. This is the Forerunner 920XT, with highly advanced features including new travel dynamics, VO2max estimate, real-time tracking with Live Track function, Smart Notification, daily step recording, sleep monitoring, bandwidth Motivational to movement and daily caloric consumption. The Forerunner 920XT includes a number of important workout features in a sports watch and easy to wear under the mud because it's 18% thinner and 15% lighter than its predecessor, the Forerunner 910XT . It comes with a high resolution color screen and can be worn every day because if not used in training it becomes a wrist sports watch. It also becomes a fitness band: measures the calories and calories burned during the day, giving you a more complete picture of your daily activity. If you're training in the pool or in free water, the Forerunner 920XT acquires detailed swimming metrics, including distance, pitch, number of arms, arm frequency, SWOLF score and more. The Exercise Recording function allows you to easily record swimming exercises including rest periods. Use time alerts to help you keep pace or distance alerts to know when a series ends and start a new one. There are also calorific and arm frequency alerts available to set up directly on the device. The 920XT is compatible with speed, cadence and heart rate sensors to provide advanced training capabilities for your sessions. You can also view Power Metrics when it is associated with one of the products of the Vector ® Single or Dual Sensor Line. If you train with a HRM-Run cardio and a Vector , associated with the 920XT, you can get an accurate VO2Max rating. Another feature that allows you to compare with others is the Garmin Connect segments. Once you've finished running and uploaded to Garmin Connect , you can see your position in the segment rankings so you can challenge yourself during your preparation on specific key points. The first to include race dynamics data for a GPS watch for multisport. Based on the same technology available on the Forerunner 620 and fēnix ® 2 , the 920XT allows you to train to optimize the ride quality when used with a HRM-Run band. This association allows the 920XT to measure cadence (total passes per minute), vertical bust oscillation (bounce height in centimeters during stride) and time to contact with the ground (how long the foot remains on the ground During each roll, measured in milliseconds). It also features an innovative wrist metronome (tones and vibration signals) that can be set based on the pace of travel you are going to undertake. When used with a cardiac band ( standard or HRM-Run by Garmin), the Forerunner 920XT offers additional features that can calculate your recovery status and race potential. The first is a recovery control, that is, a real-time indication of your condition in the early minutes of an aerobic activity. After the activity, the 920XT provides a rest time indicating how much time it takes before it can be challenged in another challenging effort. The 920XT is also able to provide an estimate of your VO2max for running when used with a HRM-Run cardiac belt and for cycling when, in addition to the cardio band, a Vector Power Sensor is also used. 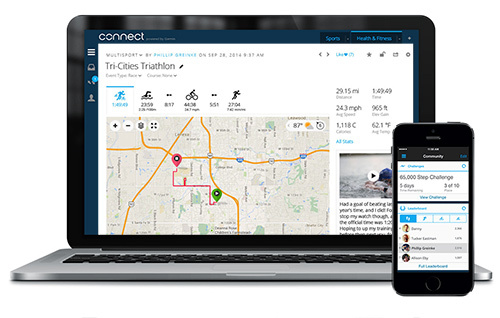 Now combining workouts and race activities can be viewed completely new in Garmin Connect , our free online community where you can save, plan, and share your efforts. When you complete a task using a triathlon or multisport activity profile on your device, each intermediate step and transition times are stored in a single combined file for analysis, allowing you to access the detailed data of each fraction that you have taken. You can synchronize data with Garmin Connect in several ways. The 920XT can transfer data via the Garmin Connect ™ Mobile app on your smartphone using Bluetooth® technology. You can also configure one or more Wi-Fi hotspots and the 920XT will sync automatically with Garmin Connect when it's in the wireless coverage area to download your data without even noticing it. Or you can synchronize with the desktop via a USB connection. Combine the 920XT with your smartphone and Garmin Connect Mobile app to take advantage of additional functionality that can help you stay connected during your workouts. By associating the 920XT with the smartphone and the Garmin Connect Mobile app, you can enjoy additional features such as the Live Track that allows you to be remotely monitored by your trainer, friends, and relatives to display your location on a detailed map with the The ability to show instantaneous and average speed and with the accessories associated with the 920xt also the heart rate, cadence, and power recorded with the Vector Power Meter. Smart Notifications allow you to view emails, push messages, SMS and other GPS watch sports alerts when this is associated with your Android ™ or Apple® compatible device. When the 920XT is associated with the phone and the Garmin Connect Mobile app, the completed workouts are loaded immediately. Just keep it in your pocket while riding a bike or running to get real-time notifications. ¹ When used with a HRM-Run ™ band; Included in some models, sold separately in others. ² When used with a cardio band. ³ Compatible with Bluetooth® Smart Ready phones . With software from version 4.1 with BLE onwards for Android and 4s onwards for iOS. Android and iOS devices must use the Garmin Connect Mobile app to enable Smart Notifications. 4 If associated with the Android or Apple device and Garmin Connect Mobile.